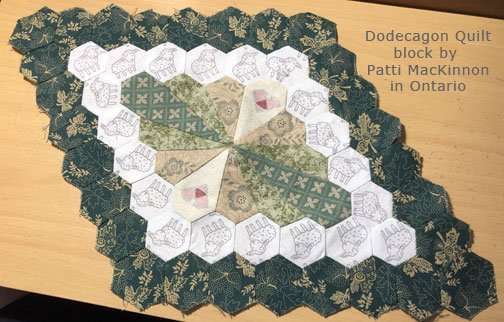 Patti sewed this lovely “Dodecagon” (do·dec·a·gon) block using the hand piecing technique taught in my Quilted Diamonds books. 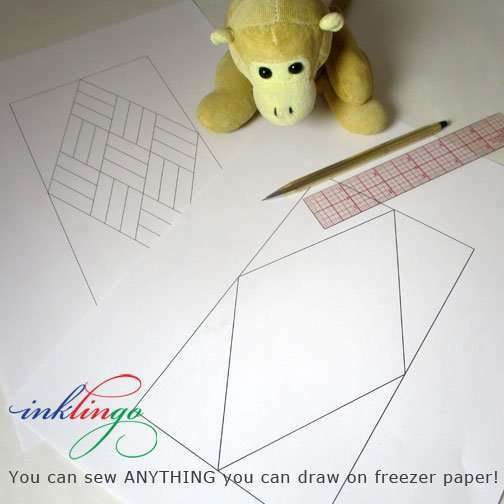 You Can SEW Anything That You Can Draw (or Trace or Print) on Freezer Paper. 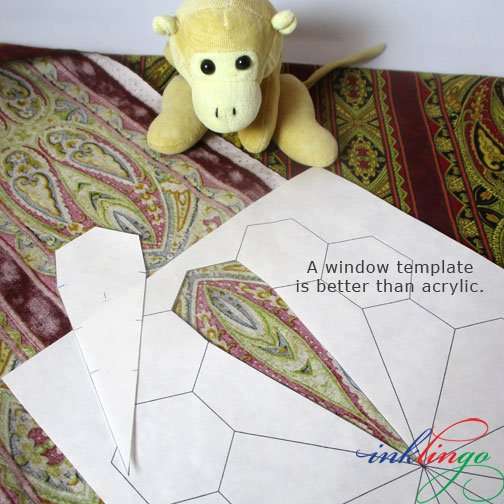 Inklingo and Quilted Diamonds are all about making quilting more accessible. 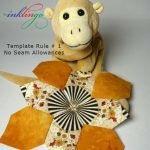 It does not have to be as expensive as you think it is to start quilting! We have just announced the Quilted Diamonds Quilt Along, so this is an appropriate time for a review. IT’S AS EASY AS 1, 2, 3 — DON’T BE FOOLED! NOTE: You do need one or two acrylic rulers for rotary cutting. 2. You can do anything and everything with Freezer Paper and an acrylic ruler. Of course, printing on fabric with Inklingo is our first choice. It simplifies everything, is faster AND more accurate than any other method. I never, ever recommend acrylic templates because they do not give as good a result as freezer paper templates. They are an inferior tool. It amazes me that quilters are talked into buying them! Make designers work harder for your business. They can do better. All you need is a ruler and a pencil (for drawing) and freezer paper, so there’s no excuse. You can do this! 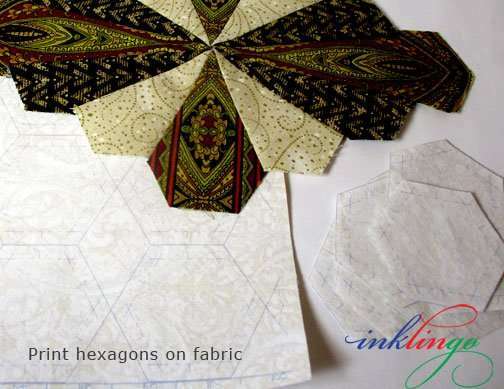 Let me give you some examples for Dodecagons, Quilted Diamonds and Pieced Hexagons. 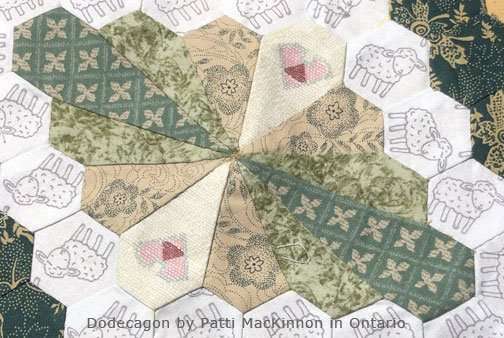 Several quilters asked for the Dodecagon shapes recently. With agreement from the designer (Margaret Sampson? ), it would make good Inklingo shape collections in several sizes. 1. Work from a picture to find a starting point for your drawing. In this case, all those hexagons are a good clue. They tell us it is a hexagon grid. 2. Trace or draw what is known. 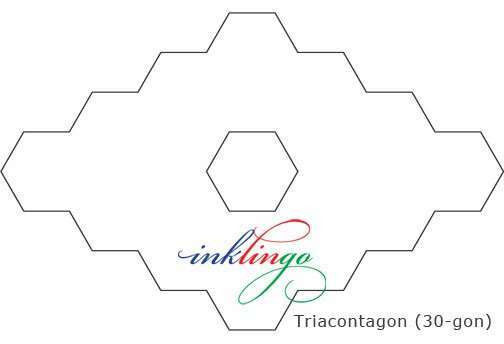 In this case, trace or draw a 1 inch hexagon on freezer paper until you have enough to get this ring of hexagons. Then use a ruler to locate the center point and mark with a †. There is often more than one way to start your drawing. This ring of hexagons is not the only way. TIP Notice that in this case, I needed a BIG sheet of freezer paper. 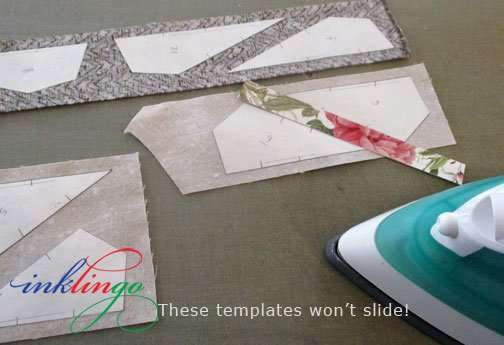 I overlapped three smaller sheets on the ironing board to create a larger sheet, as demonstrated in the “Freezer Paper Tips” video in the Top Ten Tutes. 4. 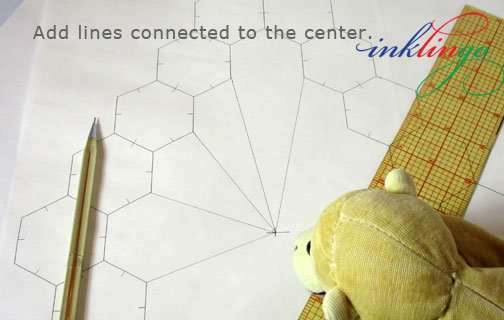 Add lines connecting the outer ring of hexagons to the center. Voilá! You have perfect shapes in the finished size. To get all the Dodecagon shapes, I added all the lines across the center. Then I transferred everything to a “master” pattern that I will NOT cut up. To get it to fit on ordinary legal paper, I did not trace all of the hexagons again. Their job is done and I will be printing those with Inklingo, so I don’t need them on freezer paper too. Based on 1 inch hexagons, this design is 6.93 x 11 inches. TIP In many cases, you only actually have to draw a quarter of the design to get one of each shape, which you can trace or copy over and over again to get as many templates as you need. There are only 4 shapes in this design (plus the mirror image of two of them) but I drew all of the lines on my master pattern. I have written many, many times before about using Freezer Paper templates and all of my best tips are described and illustrated in my Quilted Diamonds books. A lot of it is just common sense. Add info to the templates before you cut the shapes apart, to turn these into the best possible templates. For example, number the pieces on a master copy and on FP copies (above). Add matches along the seam lines. Indicate straight grain and which fabric each shape will be cut from, etc. Iron the templates to the wrong side of the fabric. Leave space for two 0.25 inch seam allowances. (I use a half-inch spacer strip, above.) Position the shapes so there will be suitable straight grain. 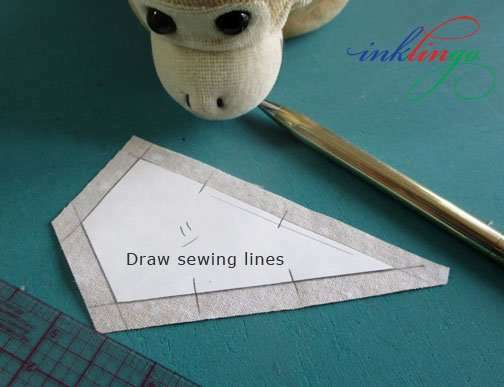 TIP We iron freezer paper to the wrong side of the fabric, so we can draw the sewing lines around the templates (below). Inklingo is the opposite. We iron the freezer paper to the right side of the fabric, so it will print on the wrong side. Either way, the lines end up on the wrong side of the fabric. Add the seam allowances when you cut the fabric. For quilting, we normally use 0.25 inch but you can make it wider or narrower. Quilted Diamonds teaches my best tips for laying the shapes out on strips of fabric, cutting multiple layers, marking the sewing lines, sewing and pressing. Use freezer paper Window Templates for fussy cutting. As usual, they work better than acrylic templates. 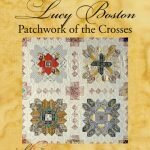 There is a very detailed article using Lucy Boston Patchwork of the Crosses as an example. Mark sewing lines (if necessary) on the fabric. 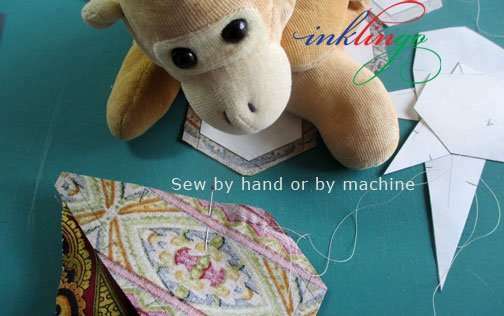 If you are machine piecing, you may not need to mark anything. 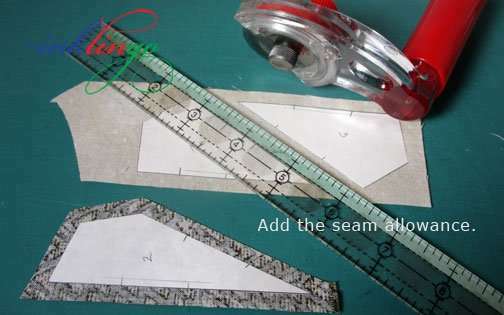 If you are hand piecing, use a mechanical pencil and a ruler (or straight edge). Extend the lines so you have crosshairs to mark the seam endings. Add matches along the sewing lines, if necessary. Marking the sewing lines is an extra step but it is faster and less work than basting every shape to paper, with more benefits! 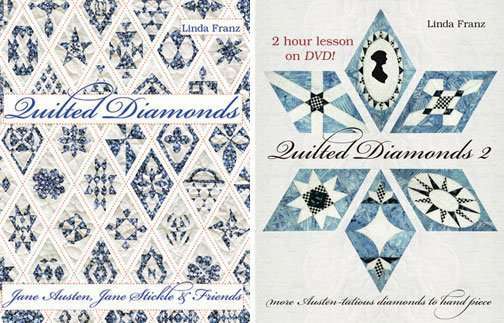 There are detailed, illustrated instructions for hand piecing in my Quilted Diamonds books. As you can see, there was never a point where there could have been an advantage to using an acrylic template—or any template that includes the seam allowances. In fact, by using freezer paper instead, I have more info on each piece of fabric and that makes the sewing easier. 12 pieces meet in the center of the Dodecagon block. 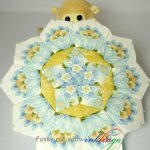 You will be happy with the results when you “circle the intersection” as described in my Quilted Diamonds books, in the two-hour DVD lesson in Quilted Diamonds 2 (fabulous), and in a short video for Kaleidoscope Stars. 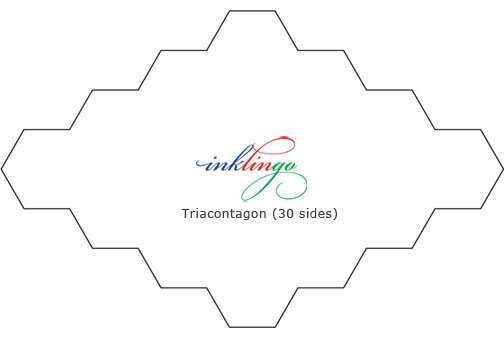 Print the hexagons with Inklingo and add them with a running stitch, sewing continuously from one hexagon to the next. There are videos on the Main Hexagon Page (under the Shop tab on the website) showing how to sew hexagons by hand or by machine, including “continuous stitching” and how to press for the best results. There are many sizes of hexagons available. 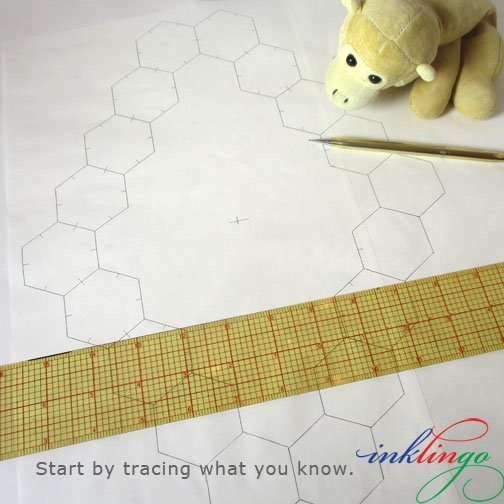 I used 1 inch hexagons but you could trace hexagons in any size as your starting point. If your quilted Diamonds book has not been delivered yet, you can use this same method to design your own while you wait. Start with a 4 x 7 inch rectangle (above). Join the mid-points of the sides to create the finished size of the diamond. Then divide it up any way you like! Of course, you can start with a hexagon outline instead! 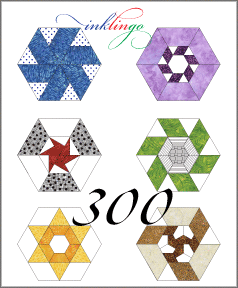 There are ideas for 300 + Pieced Hexagons in a video on the website. 1. 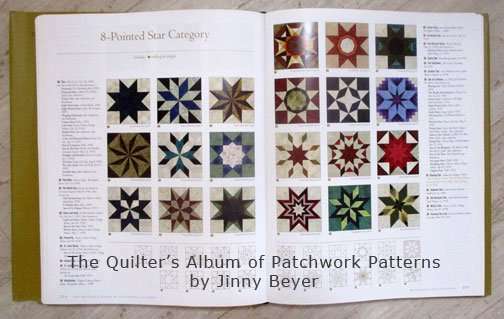 Jinny Beyer’s Quilter’s Album of Patchwork Patterns is my favorite resource. 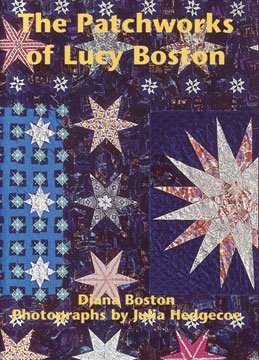 It is the one quilt book I cannot live without. This book always tells you what “grid” the design is based on—brilliant! I fussy cut one of Jinny’s border prints for my “dodecagon” too. 3. Of course, Electric Quilt is a wonderful design tool! You can use it to print your own “graph paper” or the outline of any block on freezer paper, cut it apart and sew it together again! There are free project files under the EQ tab (above). 4. 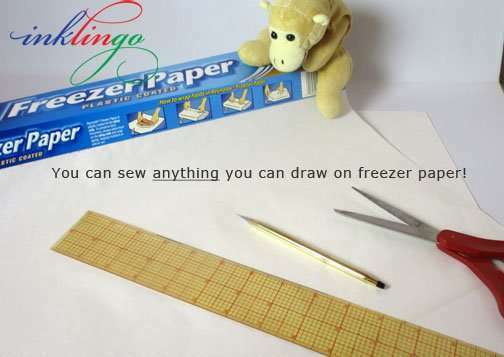 There is free graph paper online which you might want to print on freezer paper to guide your tracing/drawing. Dodecagon (do·dec·a·gon) is the fancy name for a 12 sided shape, as in the examples above. Quilters have been calling this a Dodecagon but it has 12 SHAPES, not 12 sides. 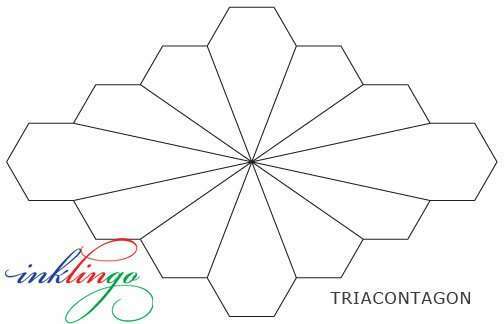 The shape is actually a 30-gon or a TRIACONTAGON—a polygon with 30 sides. In my experience, neither of these words come up in conversation very often. 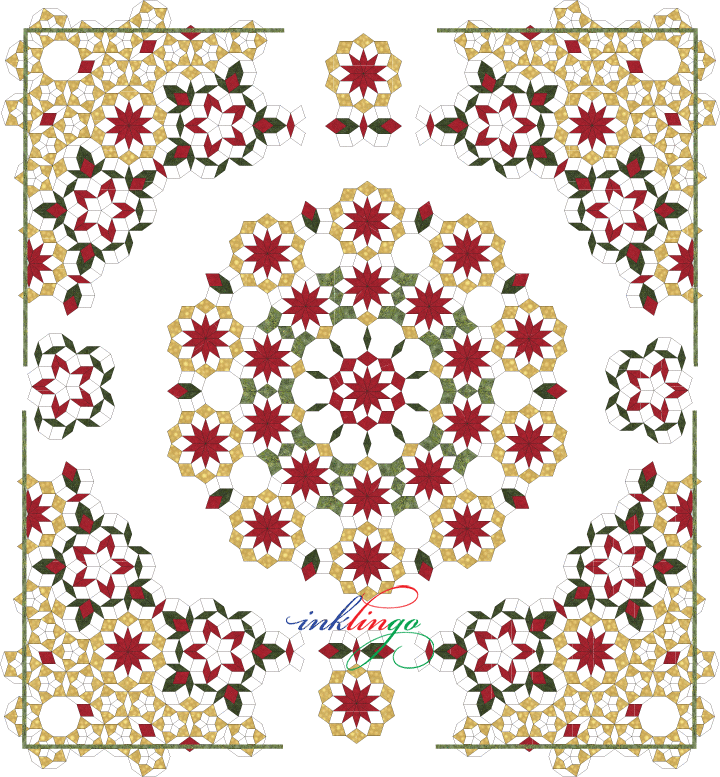 It is better just to call this a very pretty quilt design. How many ways can you divide up this 30-gon shape? Maybe you would like a hexagon in the center to avoid that tricky intersection! Maybe you would like to use larger or smaller hexagons as a starting point. You are the designer—thanks to freezer paper. Create your unique variation! I hope now you can see why I print with Inklingo whenever possible but when shapes are not available from Inklingo, I use freezer paper—never acrylic templates. 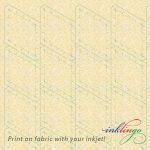 Printing on fabric with Inklingo eliminates several steps and adds precision. The videos on the Main Beginner’s Page on the website are intended to make it easy to get started—FREE. Diamond Triangle Square shape collection. The free shape collection includes the first chapter of The Inklingo Handbook too. However, when some of the shapes are not Inklingo-able (yet) the fabulous photos, including close-up details, tell you everything you need to know to draw on freezer paper and sew! If you are ordering Quilted Diamonds, remember that I can fit two books in the flat rate Priority envelope (USA) for $6.95. Make the most of the postage when you order two books at a time. Quilters have been sharing photos for the Quilted Diamonds Quilt-Along in the Inklingo IO Group (friendly) and on Facebook, including the Inklingo Quilters and Fans Facebook page, and on Instagram and Pinterest. If you have suggestions about creating a separate group, please let me know. I’m easy. Hi Linda, I so much enjoy your website. Thanks for your wonderful ideas and pictures! I have a couple of questions. 1 – I need to change my email address. Do you share email addresses? I’d like to give you my personal address, but if you do share, then I’ll leave it as is with my general mail. How do I change the address? 2 – I need to get a new printer, since my current printer is not compatible with Windows 10. I noticed that you use a Canon which is what my old printer was. I’m looking at a Canon PIXMA MG3620 Wireless Inkjet or a Canon PIXMA TS6120 Wireless Inkjet. The first is $40 and the second is $100 on sale for $50. Do you know if either of these is compatible with freezer paper and fabric?? Hi Maggie, I am pleased that you enjoy my website. Thank you for letting me know. 2. Any ordinary Inkjet printer is fine for Inklingo but many of us prefer Canon printers. No affiliation. Canon software makes it easy to set custom page sizes. I cannot keep up with every new model because they change so frequently. Personally, if I needed a new printer right now, I would choose Canon. There is detailed info about choosing a printer in the FAQ under the Support & Goodies tab on the website. https://lindafranz.com/section/faq/question/45#q45 I hope you find one that you enjoy using as much as I enjoy mine. When you get your new printer, don’t forget to start by printing an ink test, as described in the Top Ten Tutes on the blog and in the first chapter of The Inklingo Handbook (included in the free Diamond Triangle Square shape collection. I just cannot believe how beautiful this block is !!!!!! This will be an amazing quilt for sure. O.K. now I need to find time to make this block. Thank you to Patti in Ontario for sharing with you and of course you passed it along to us. I will be looking on the Groupe IO for pictures of this block. Patti does beautiful work and is a dedicated hand piecer!